Ernest Hemingway first attended a bullfight in Pamplona in 1923, and he did not expect to like it. “Most people who wrote about it condemned bullfighting outright as a stupid brutal business,” he recalled; even its supporters “were apologetic about the whole thing.” And the politics were all wrong. For the better part of a century, Europe’s left-wing reformers had been crusading against bullfights—they thought them inhumane, and needlessly cruel, and distrusted the public bloodlust. In the Spanish Civil War, Franco would become the great protector of the toreros, the bullfighters. The Republican armies, like the socialists before them, would storm farms that raised bulls for fighting, massacring the ranchers. “One less torero, one less fascist,” proclaimed the left-wing newspapers. In the novelist's hands what had been a provincial curiosity became not merely art but, in a continent slowly edging towards a decade of savagery, a reminder of the primitive fragility of European life, and the human attributes needed to transmit violence into grace. Artists and filmmakers have followed Hemingway’s metaphor for nearly a century. “The truly great killer must have a sense of honor and a sense of glory far beyond that of the ordinary bullfighter,” Hemingway observed. “In other words he must be a simpler man.” For a country to love bullfights, Hemingway believed, “the people must have an interest in death.” But Hemingway is an imperfect guide, stalked by his own parody, and one always suspects that he is painting the crowds in his own image, complete with mustaches and stylized caps. Underneath this dense, gorgeous mat of metaphor and abstraction, what was it, exactly, that the artists had seen? 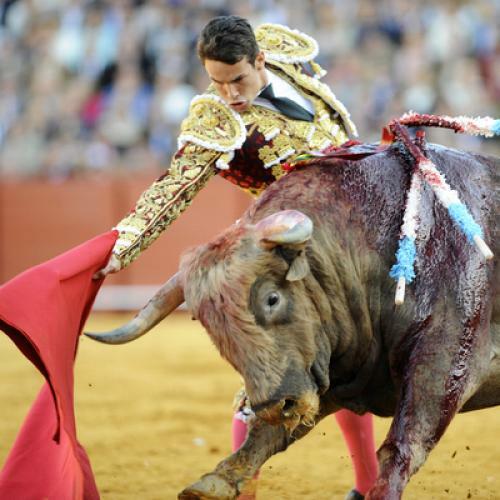 Was bullfighting a humble, ancient genuflection towards death, and to the frailty of life? Or was it simply stylized bloodlust, training the crowd for uglier violence to come? The first organized bull-based entertainments, in medieval Spain, were horrid affairs. Bulls were slathered in gunpowder and set on fire, drowned in water, and hurled to their deaths from the tops of cliffs. In nineteenth-century Seville, a city grown rich as the port of the Americas trade, young bourgeois men began to refine these peasant rites, and elaborated bullfighting as a three-act ritual. Its very form, Hardouin-Fugier notes, was designed to mirror public criminal executions, down to the period of time that the bull was secluded before the event. In the first act, mounted picadors stab at the bull with lances—up until the 1920s, this first act would often culminate when the bull, provoked, disemboweled the horses, and this opening was testimony to the bull’s raw power. Then the matador enters the ring, unarmed but accompanied by two other men, whom he protects from sight with his cape while they hurl harpoons into the bull’s neck. In the third act, the matador re-enters alone, with a cape and a sword, and baits the bull to charge, again and again, until the animal is so weary that he bows his massive head, and the swordsman, elaborately, stabs him in the neck. For Hemingway, this ritualization of death required a primitive pre-Christian valor. A matador distinguished himself first by his wrists and second by his waist, but these were useless flourishes if he lost, as many did, pride in killing. The most valorous matadors, he thought, were the ones who were proud to kill, and that kind of pride was "a Christian sin, and a pagan virtue. But it is pride which makes the bullfight and true enjoyment of killing which makes the great matador." It is startling to see photographs of the great fighting bulls, so massive that they seemed to dwarf not only the matadors but also the horses. The bulls were bred with thick mounds of muscle on the back of their neck: it was impossible for a sword to penetrate them. The effect of the bullfight owed a great deal to a sword technique called the escotada, which dealt a bloodless death blow by puncturing the lungs, reached through a point near the shoulder. “The internal hemorrhaging caused by severing the pulmonary or cardiac blood vessels often leaves the animal standing long enough to guarantee a dramatic effect,” Hardouin-Fugier reports. The bull was left slumped, unable to breathe and slowly drowning in its own fluid. It seemed, to spectators, a tolerably noble death; in fact it was an excruciating one. The tactic, she argues, “could be encapsulated by Michel Foucault’s definition of torture: ‘maintaining life in pain.’ ” Horrors such as these attracted the outrage of some celebrated left-wing journalists and activists—the anti-slavery legislator William Wilberforce, Émile Zola, the crusading feminist writer known as Séverine—but their activism, in turn, provoked a fuller defense of the sport from the aficionados. Bullfighting was just as popular during the 1920s and 1930s, but it drew more artistic attention. Hemingway exemplified not the crowd in search of an entertainment, but the artist in search of a metaphor. What makes Hemingway seem limited now makes him indispensable as a documentarian of a moment, after the mechanized butchery of World War I, with wild, fractious politics suggesting the bloodbath was not yet finished (“the truly great killer”), when death seemed to hang over everything, very near, and more than anything to pose a challenge to the continent's valor. "The book piles upon you wonderfully," Maxwell Perkins wrote of Death in the Afternoon, "and becomes to one reading it—who at first thinks bullfighting only a small matter—immensely important." But eighty years later, bullfighting remains a minority taste, and the romance now is mostly a tourist’s romance. In Spain, the sport could not displace soccer; in Cuba, the crowds quickly turned to baseball; in Mexico, even cockfighting proved far more popular. Hardouin-Fugier is programmatic: she wants the Spanish and French governments to cease the small subsidies they still give to the sport, and for public taste to turn against the sport, on grounds of cruelty. She catalogs so many injustices that it is hard to disagree with either of her aims. But in her zeal to rebuke the aficionados and their artistic enablers, she misses certain hard truths. She emphasizes the periodic lobbying by toreros for smaller bulls—but even these smaller bulls were truly massive, terrifying creatures, which in the ring seemed not only to dwarf the matadors but the horses too. And she writes about the matadors as if they were simply showmen, certain of victory. But the danger to them, their proximity to pain and destruction, was very real. Like so many other writers on this ghoulish subject, Hardouin-Fugier’s writing on bullfighting is really writing about the seduction of death. “Many people with suicidal tendencies who ‘find life only in death’ are attracted by bullfighting,” Hardouin-Fugier concludes, dismissively, before naming a half-dozen artists, Hemingway among them. But for a particular moment in time, it was not only the suicidal who were drawn in, hoping to find meaning and ennoblement in death. The hope was misplaced. What bullfighting had to offer was only a stylized form of valor and an aesthetics of destruction. In the bullring there was no transcendence of death, just death itself. Ben Wallace-Wells is a contributing writer at the New York Times Magazine and a contributing editor at Rolling Stone.